KACY is retired from breeding and is happily living in Bonida, SD as a beloved pet and farm dog. Shiny is an attractive red tri-color female that we have kept for breeding out of Cowboy and Kacy's 4th litter together. Several of her siblings have been trained and have careers as Service Dogs with disabled children and adults, including her litteri-mate sister, Daisy and her elder sister, Narissa. She had her first litter 4/11/2012 and produced 3 daughters and 2 sons. We have kept the blue merle daughter from this litter, a female we have named Spice Girl. Her second litter was born 7/01/2014, again 3 daughters (Ginger, Jessa and Minnie) and 2 sons (Terry and Jedidiah). She is now also a grandmother, as Spice Girl had her first litter on 6/19/2014. As we are now currently keeping merle females and utilizing tri-colored males owned by other local breeders, Shiny is being offered for sale as a breeding female. WE ARE ASKING $450 for her with full breeding rights. We can mail or email current photos of her and a copy of her pedigree to interested parties. Pet only offers will also be considered, but are subject to a signed spaying agreement. Spice is a gorgeous granddaughter of our foundation pair, Cowboy and Kacy. She has the same sweet, gentle, biddable and intelligent disposition of her mother Shiny, her Aunt Narcissa and her grandparents and closely resembles her sire, Stetson in appearance. Spice was bred at http://www.gravattperformancehorses.com for her 1st litter to their 11 inch tall, 10 lbs blue-eyed black tri stud, Gonzo. She gave birth to 2 blue merle toy daughters on 6/19/2014. Josie is the smaller of the two sisters and is marked very similarly to mom and has brown eyes. 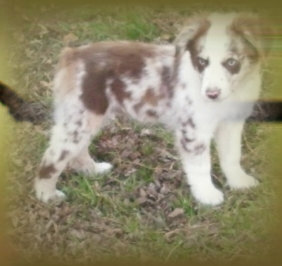 Johanna is only a tiny bit taller than her sister, lighter in color with more white markings and has one blue eye and one brown eye. Both pups have a generous amount of copper marking in their coats. Paris is our son, Charlie's, red merge female. She has golden-green eyes and is marked very similarly to her niece, Spice Girl. At a year old, she is 12.5 inches tall and weighs about 14 lbs. Planned mating to Gonzo in Spring 2015. Karen is a full litter-mate sister to Pair is and younger full sister to Shiny. Like Paris, she is 12.5 inches tall and close in weight a 13 lbs. Karen has one brown eye and one eye that is half blue and half brown. She also has a full white collar and light toned copper markings. Planned mating to Gonzo in Feb/March 2015.